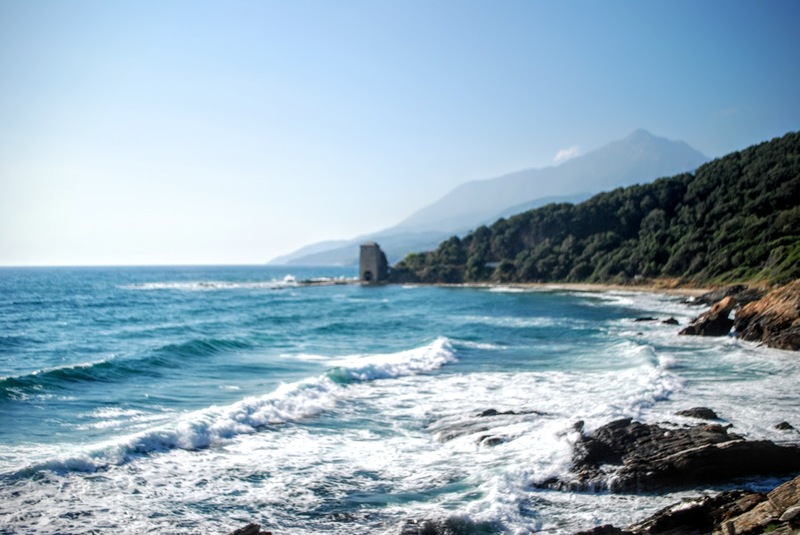 A pilgrimage in Greece: hiking among the monasteries of Athos, the Holy Mountain. First Chapter. If I close my eyes now that I am back home I can still hear the austere melodies, see with my sleepy eyes the glittering icons, the light of the candles floating in the dark. They are being moved. They pass in front of me, distant, framed by the two subsequent doors separating me from the katholikon, the most sacred part of the church, which is prohibited to me. From that direction comes a smell of incense. I watch like an intruder, I feel like this even in my memories, guilty. I feel — but I don’t hear — the rustle of the long robes of the monks, moving slowly. Then I try to catch a glimpse of human weakness in the monks’ eyes, a trembling in their voice, while they perform gestures that I don’t understand, ancient rites of a spirituality that I think I recognize, but which feels distant. The words and the stare of a monk are still echoing in my head. He warned me, an Italian and a Roman Catholic: “Don’t listen to the Pope, he is a Wolf in sheep’s clothing”. It’s a hardness that stayed in my thoughts, but doesn’t darken all the rest: the welcomes, the smiles, the encounters, the brief conversations. And all that I learned in this trip, embracing history, religion, nature. And the nature, an imposing, wild, awe-inspiring nature that for centuries has let men sense the infinite. In my recollections there’s an image superimposed over these. It’s that “triangle in the sky” that ninety years before had already amazed Robert Byron. 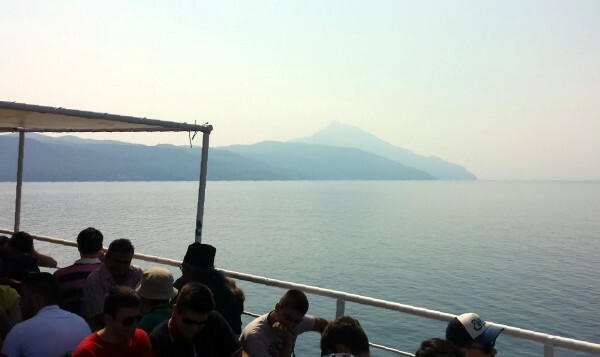 And in my memory the impressive profile of Mount Athos is still looking at me from a distance, as if I never reached its summit. It’s still untouched. This finger of the Chalcidice peninsula where “the years have stopped”, as Byron wrote, isn’t probably much different from what it looked like in the 1920s when the English writer came here. And, more than all the images crowding my mind, there’s a feeling that stayed with me, distinctly: that I have been travelling in time. I have been thinking about this trip with some friends for 15 years. I don’t remember how it all started. Maybe as a joke, with the idea of inflicting ourselves a trip in a remote, completely womanless place (because of ancient law; if asked, most will tell the same story, that it was an order of the Virgin Mary, who told the first hermits “This is my garden”). 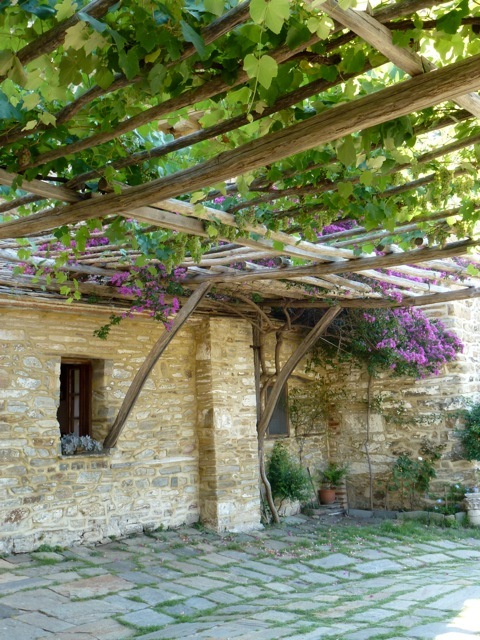 But, as the years passed, this dream took roots, became more structured, because our love for Greece deepened and we wanted to see such a special, unique place. And because it was a place that spoke about the east, and that would have taken us to the heart of the Orthodox world that appeared so fascinating to us. At the beginning of this year one of these friends called me and we agreed it was time to go: this year we would both marry in late summer and July was the right moment to do this trip together. We applied for the diamonitirion, the permit to enter the area six months in advance. 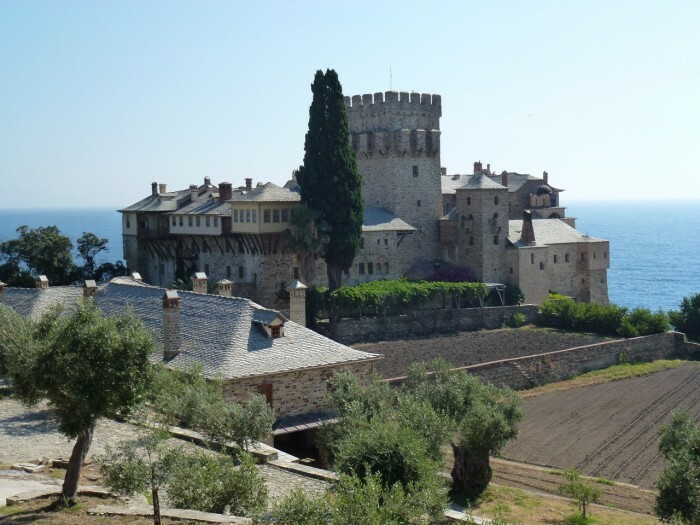 A trip to Mount Athos has to be carefully planned. Every day this visa is granted to up to one hundred orthodox pilgrims and just ten of other religious beliefs. Only men are allowed. 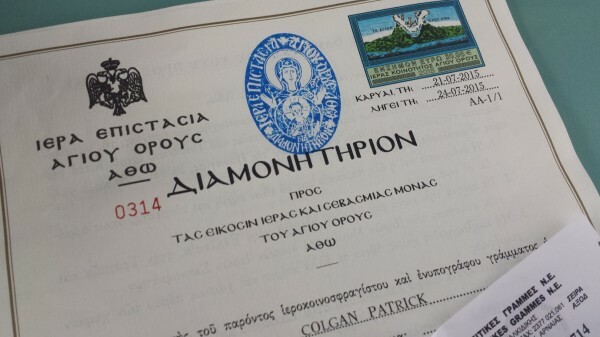 And so we arrived here, on a ferry travelling from Ouranoupolis to Dafni, in the heart of the Monastic State of Mount Athos, with that permit that I had long desired, folded inside a pocket of my backpack. Sometimes I check if it’s still there. The ship steadily sails on the blue sea and we see emerging from the haze and the water the big, unmistakable silhouette that here is simply called Aghion Oros, the Holy Mountain. We will walk during the day and sleep in the monasteries that we booked months ago. I think about the future, about the next days, but in a way I have already arrived, even if I am still on the ship, I think. Because I am already inside another world, and the strange atmosphere of Ouranoupolis, part quiet seaside resort, part border town, part pilgrimage site, feels far away: on the coast, the taverns and the beach umbrellas gave way to woods, monasteries, skiti (similar, but of a lower level) and kaliva, hermitages, that pop out between woods and rocks. And then there is the ship. It’s a floating microcosm: on board there are only men, and the various languages of the pilgrims mingle, creating a strange soundtrack to the journey. 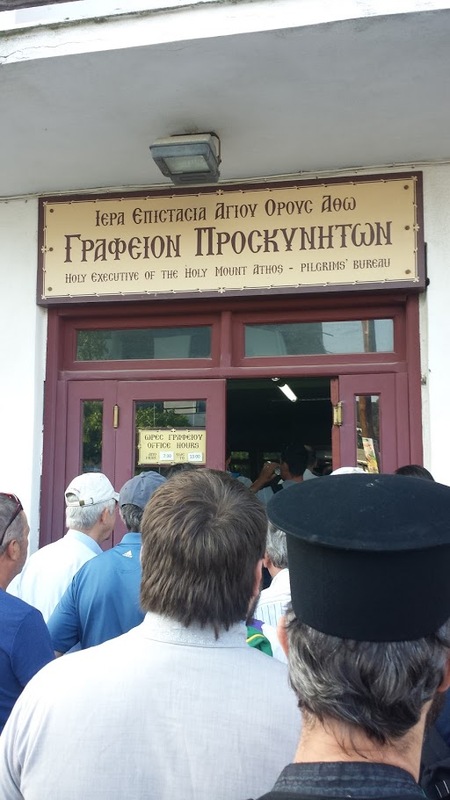 Besides the many Greeks, there are Serbs, Romanian, Bulgarian, Russian pilgrims. There is also a lonely guy with a bulky trolley and a backpack with a brand that I instantly recognize and gives immediately away his nationality. Only the Italians have the colorful Invicta backpacks, hugely popular in the Nineties. I think about getting closer and trying to chat a bit with him. But he anticipates us. Shortly after, he comes to ask us — the first of many times during this trip — why are we here. 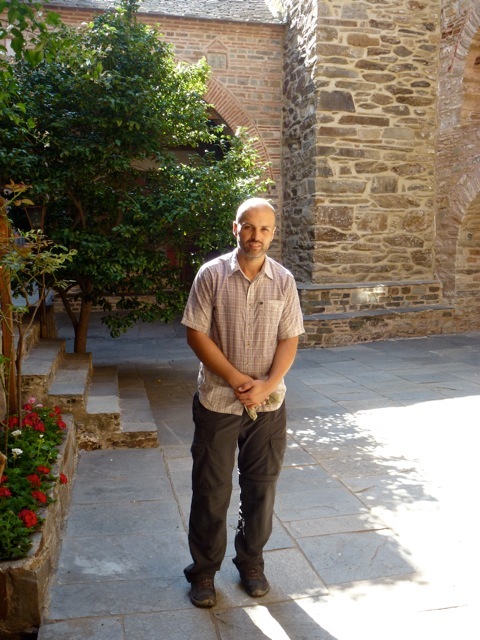 He tells us that he discovered the mistakes of Roman Catholicism and became a Christian Orthodox: he’s going back to the monastery where he was baptized. We walk suspended between land and sea, with the heat exerting a constant pressure on our brains. 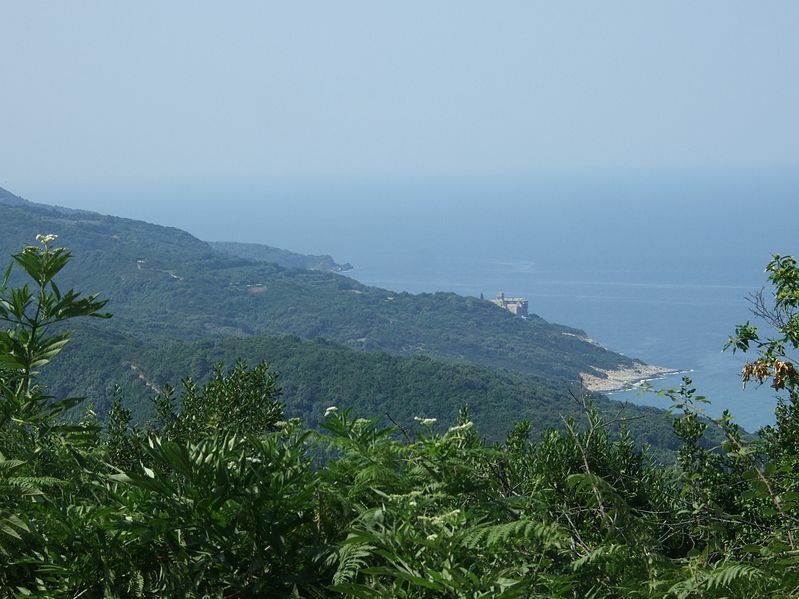 Sometimes the path leaves the high cliffs, we leave the trees behind us and begin feeling sand under our shoes: from the beaches we see again that distant, two thousand metres high “triangle in the sky”. It indicates the South but it wouldn’t be difficult to find our bearings even if we couldn’t see it: there is the sea that we keep on our left and the peninsula’s outline to follow on the map made by an Austrian, whose name here is pronounced by hikers with the reverence reserved to undisputed authorities, “the Zwerger”. On these paths legs tire quickly, and thoughts continuously go to our dwindling water supply and the insufficient food we are carrying with us. Hunger bites. Yesterday we slept at the big Iviron Monastery and today — it’s Wednesday, a day of fasting here— we had only a glass of tea and stale bread as breakfast. 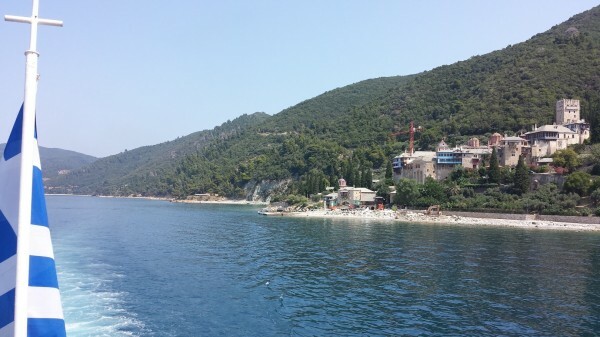 But on Mount Athos you are never too far from a monastery, where visitors are always welcome. The outline of the smallest monastery, Stavronikita, emerges from the blue. It contains an ancient Saint Nicholas Icon and famous frescoes by Theophanis from Crete we are eager to see. When we are a few hundred metres from the monastery a slight, dark figure comes out of it and seems to look at us, then goes back inside. When we arrive the monk comes out again with a smile. “Welcome”, he says in a perfect English. He lays a tray on a wall. It carries two glasses of cold water, a few loukum sweets. He also brings two small glasses of Tsipouro, a strong, anise-flavoured spirit, even if it’s only eleven in the morning. Above us a vine pergola, laying on us a cool shade, in front of us the sea, of the deepest blue I have ever seen. Even now, I know it’s a moment I will never forget.